Mickey and his pals throw a wild party - so wild that roast chickens and lamps come to life and join in the chaos. The police come to put down the racket, but end up joining in themselves. When the band makes it's second appearance (about 5:45 into the short) the two musicians in the upper right are missing, but then magically appear a few frames into the scene. A scene showing matches burning, then looking like Al Jolson in blackface. Mickey and the gang's playing is so catchy that the furniture, household items, and even the cops (sent to quiet the noise) get caught up in the revelry. I enjoy how the dancing is very sedate until the food is served. Everyone stampedes for the food - then the party speeds up. I also enjoy the ending scene when the cops arrive. You are led to believe the cops are going to break up the party, only to find the cops have joined in the merriment. The often censored scene of the matches dancing and striking themselves - resulting in their black faces - also has them saying "Mammy!" I don't care too much for this short, but I certainly do not hate it. Some funny scenes were where Mickey slices ham like he's playing a violin and where Goofy tickles Clarabelle with a party favor. She gets even though, she takes a boxing glove with horseshoes in it and puts her party favor in that. Then she punches Goofy with it and he lands in the fishbowl where the fish end up tickling him. I did notice that the scene with the dancing pig was recycled from the 1930 short The Shindig. Ah, 1932 when Mickey ruled the world. Nineteen thirty-two was the worst year of the Depression and the American people NEEDED to feel good. Mickey Mouse was the man (I mean the Mouse) for the job. 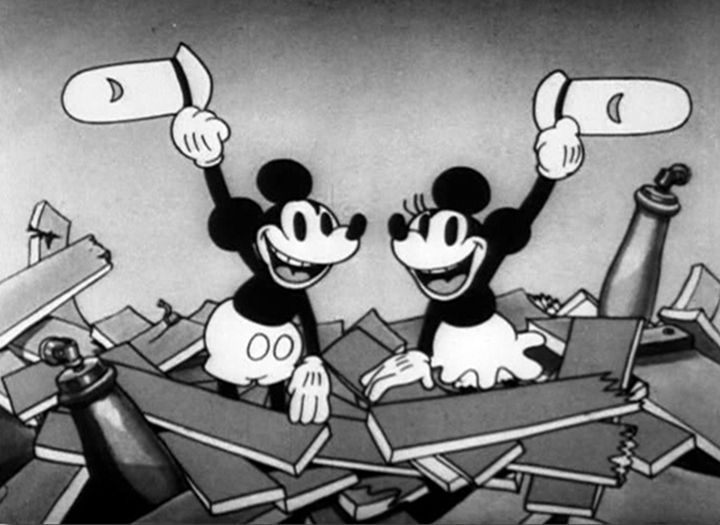 Fourteen Mickey shorts were made in 1932, the most ever created in one year. 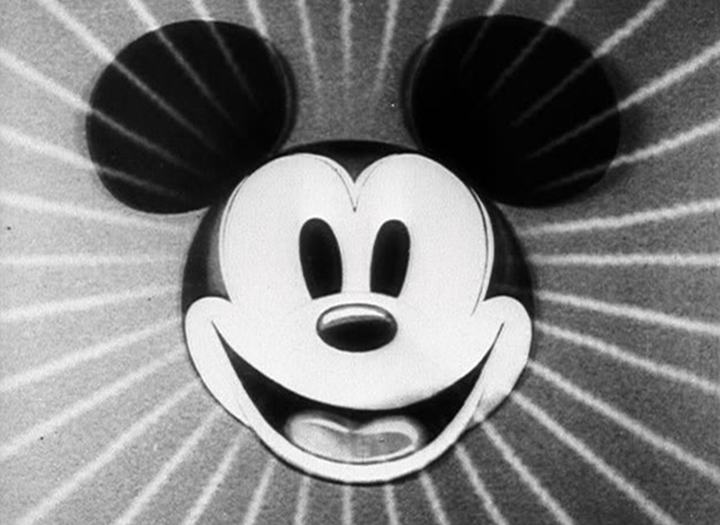 They include Mickey at his manic best (The Klondike Kid) and my two favorite shorts Touchdown Mickey and the greatest Mickey short of all time Mickey's Good Deed. 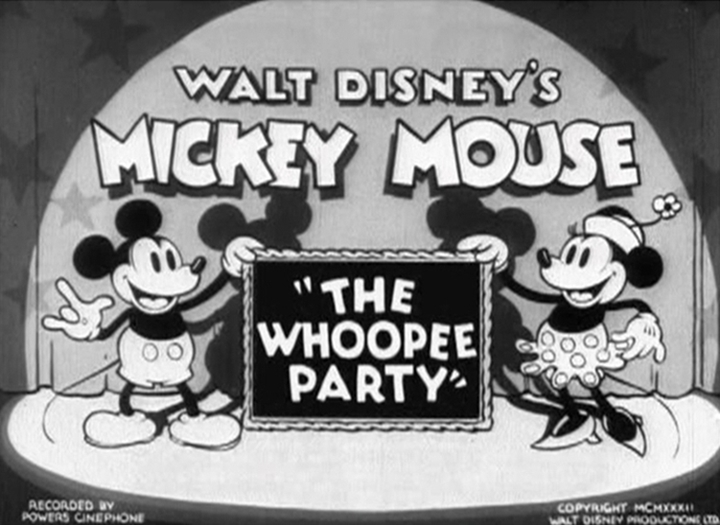 The Whoopee Party is a good example of Mickey's spirit during this era. Despite his obvious poverty Mickey manages to throw together a wonderful party, with food, dancing and fun, fun, FUN! My favorite scene is when Mickey dances with the FULL figured pig because no one else is dancing with her. Everyone is having so much fun that soon the food, the furniture, and even the police (who arrive in force to break the party up) join in. This high energy short is short on dialog, but long on sight gags and pure FUN. With its huge cast of rubber-hose style characters it was easy to see why they picked this cartoon to show [on House of Mouse.] And this is what I call a cartoon! Just enough plot to set up the premise: Mickey and Minnie throwing a party. It's a short, it didn't need any more plot. Instead the music determined what action happened onscreen. And the short had great music, very danceable. Character movement and the timing of any gags precisely followed the rhythm set up by the music. So everything flowed very smoothly. And the makers came up with very imaginative ways to make characters and objects move. People could snake through the crowd if they're skinny, or beat like a drum if they're fat. Furniture could come to life and dance with the people without disrupting the rhythm one bit. That hatrack and chair sure had some great moves. For variety they even threw in a couple of plot points. Dippy Dawg and Clarabelle Cow exchanged pranks in a hilarious face-off where they showed personality. Then suddenly near the end a paddy wagon of cops showed up to spoil the fun, but I LOL'ed at what really happened. I was never bored at any moment. I have seen The Whoopee Party on The House of Mouse on the Disney channel and give the cartoon an 8 out of 10. The music was great but the comedy was only helped when Goofy and Clarabelle Cow get into a dual. 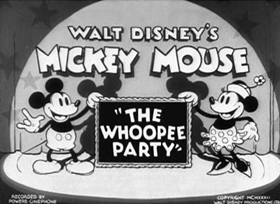 "The Whoopee Party" is certainly high-paced and fun, featuring the typical shindigs seen in black and white Mickey Mouse cartoon shorts from the 30's. 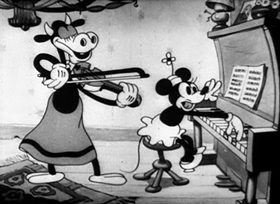 Clarabelle Cow and Goofy (called "Dippy the Goof" in this cartoon) serve as the main sense of comic relief with their antics. This was a fun short. Mickey is great on the action shorts or the shorts with lots of music! I always liked the music Walt Disney put into most of the Mickeys. This one had no real plot, just Mickey and Minnie giving their friends a great party with lots of food and entertainment. One of the funniest scenes was when the food was ready, All the guests just piled on and grabbed what they could then settled down to party some more. All the characters contributed equally which made this short very enjoyable. The 1930's rubber hose animation maybe by today's standards is crude, but I think it gives the classic shorts a look that computer generation could never match, and I think that there was more heart put into making them during this time. In 1932 consistent storylines where reintroduced with a remarkable success to the Mickey cartoons (for example The Barnyard Olympics and Touchdown Mickey). In this era the musical cartoon The Whoopee Party with its total lack of story seems to be quite old-fashioned. 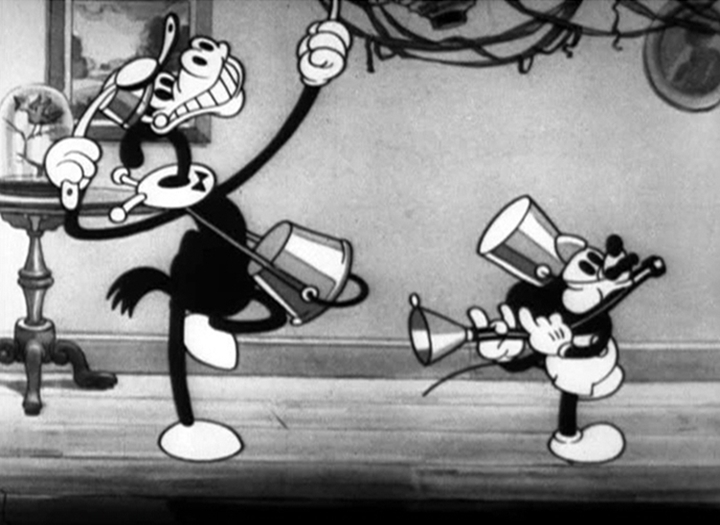 It contains numerous earlier used elements: a public dancing, Minnie singing behind the piano and alive inanimate objects (although the latter feature was more common practice in the Fleischer cartoons of that time). Nevertheless, the sheer fun with which everything is executed, makes this cartoon a delight to watch. In this cartoon Goofy gets the looks he would maintain until his redesign in On Ice (1935). He's more than just a silly laugh now, but he's still more weird than likeable. 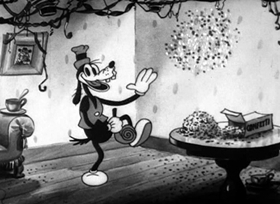 The Whoopee Party contains some nice effect animation of confetti and flying feathers. It also reuses some animation of Clarabelle Cow dancing and mooing from The Shindig (1930). The Whoopee Party may be an odd title for a short, but the contents give us an interesting and funny short that shows a little glimpse of the future. In many ways, this is a transitional short, with the integration of some of Mickey’s past and future all in one package. As we’ve seen, Mickey started off his career with a couple of friends in addition to Minnie and Pluto – Clarabelle Cow and Horace Horsecollar. In this short, he adds Goofy to the mix. And, for the first time, Goofy mixes things up with Clarabelle, Horace and Minnie. Pluto’s absent in this one, but it’s all good, as Goofy shows his comedic chops. The subject of the short is really just one big party. Mickey and Minnie are the hosts, but a plethora of animals have joined the fun, with a huge dance floor full of eager dancers. 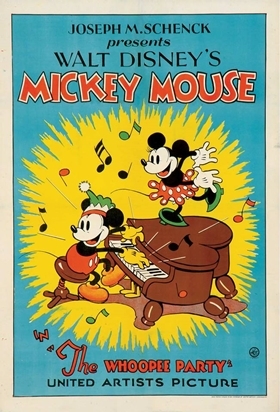 Minnie provides the music at the piano for the majority of the short, while Mickey opens up with Horace and Goofy in the kitchen making food. Goofy gets the honor of unveiling the food to the masses, causing the predictable stampede to get snacks. This is another Mickey short that has a rhythm and flow to it, with every action taking place to a steady beat. The music picks things up, as there’s really not a lot of story here, but having the characters swing along to the rhythm keeps things swinging. Even inanimate objects get into the act, such as a pair of lamps flipping on and off in time with the music. Ultimately, the cops show up to break up the party, but instead decide to join in the fun. The final scenes of the short feature Minnie and Mickey dancing up a storm surrounded by the policemen. It makes for a cute and emotionally satisfying ending. There are some issues with the short, however. For one thing, Minnie doesn’t have much of a role. She spends the majority of the cartoon seated at a piano, and with the exception of an animated stool giving her trouble, there’s not a great gag associated with her. In fact, most of the characters in this short get upstaged by Goofy. In addition to his role in preparing the snacks and unveiling them, Goofy gets another great gag when he takes a party noisemaker and uses it to goose Clarabelle. The interaction between the two of them is very well done and very funny. It makes me smile thinking of how they would interact in The Three Musketeers, the direct to video film with Mickey, Donald and Goofy that came out a few years back. That film seemed like a throwback at the time, and it’s nice to see that there was a basis for the Goofy-Clarabelle relationship in that movie. And of course, the story in this one is pretty weak. There’s no real conflict or struggle for Mickey to overcome, so you’re left with a short, fun but fluffy piece of work. And that’s just fine for one short, but it’s not sustainable for multiple shorts. That’s why you’ve seen more of the Mickeys feature fun stories with conflicts as we move on through the years. Whoopee! You can't go wrong with the non-stop party atmosphere of this short! It's great to see Dippy Dawg added the mix of regulars in a party so wild even the furniture joins in! 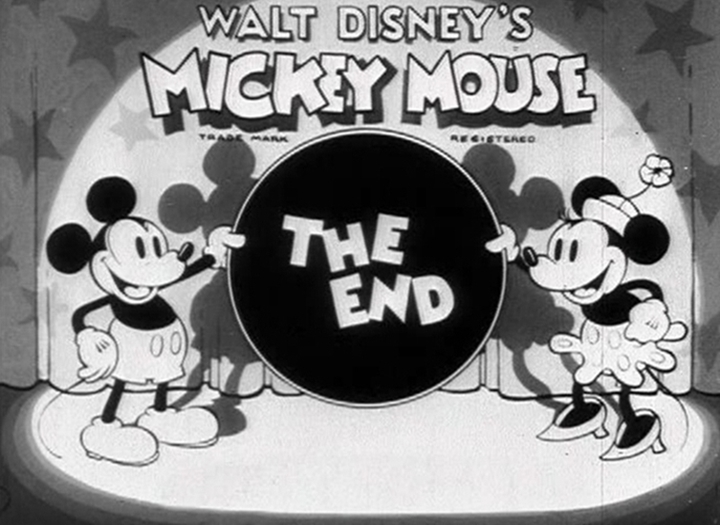 This one was picked to be part of a 'House of Mouse' episode dedicated to the black and white era. 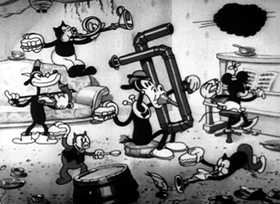 It's easy to see why what with all the mad cap rubber-hose action and 30's design and music. There's a quality vintage charm to this one - just check out the decorations at the party, the police uniforms and, best of all, the cars and horse and carts outside. One question I have about this short is what is the song Mickey and co sing at the beginning that goes: "We're the kitchen mechanics! We control the refreshments!"? I'm not sure if it's unique to this short or if it's a song that already existed. 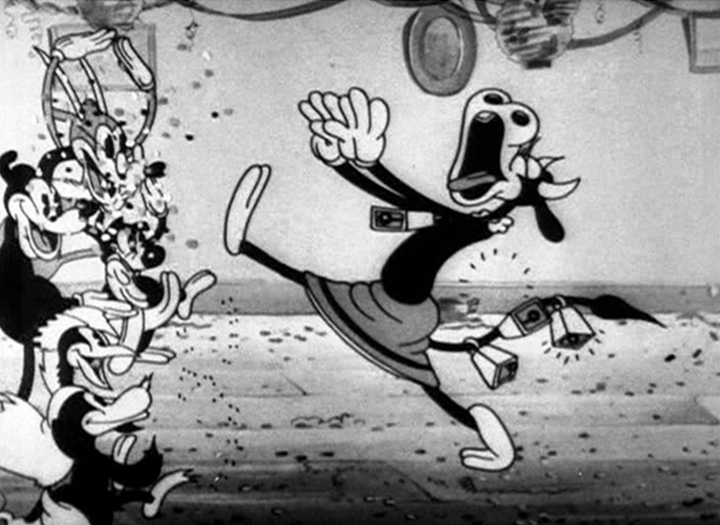 The Clarabelle and Goofy antagonism was picked up right away in the comics, with her calling him "the half-wittedest dumb ninny I ever knowed!" I liked the line so much that I put it into Gemstone's comics adaptation of The Three Musketeers film, bringing things full circle!